Welcome to NEWJAZZ Record Auctions!! MORE THAN 25,000 VINYL DISCS IN STOCK! 1000s of items in every genre. Specializing in hard-to-find small-label private and indie pressings, as well as unusual and collectible major label pieces. Be sure to add me to your. ALL ITEMS ARE ORIGINAL U. S PRESSES UNLESS OTHERWISE NOTED. Thats All Right / Blue Moon Of Kentucky. 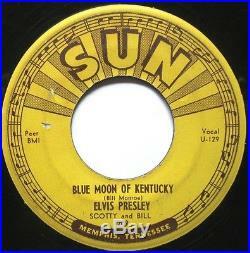 Mega-rare original classic early rockabilly by Elvis on Sun! WITH 4 PUSH MARKS (2 on each label). ETCHED MATRIX NUMBERS U-128-45 72 // U-129-45-1 72. (NOTE - Audio clips are UNEDITED and from actual disc). Light marks and scratches, significant loss of luster; skips once at approx 1:05 on A-Side. Overall plays nicely with some surface noise throughout, but the music comes through very clearly HEAR IT! (light wear, couple tiny flakes B-Side). All 7-inch singles are professionally cleaned and carefully inspected under a grading lamp with 120-watt bulb. Guidelines reflect TYPICAL factors determining grade - variations are noted in the description. Please note: I DO NOT USE EXCELLENT (EX) as a grade. I rarely use grades below VG, and all vinyl graded VG or less is appropriately spot play-graded to assure sound quality. Grades below G are not listed, as I typically do not sell merchandise in such condition. NM-, VG/VG+, VG+/++ are used, as applicable. Factory sealed; sleeve virtually flawless. Factory sealed with minor sleeve flaws, OR an otherwise mint album recently opened by me and played in spots for demonstration purposes. (Near Mint) - Full or nearly-full gloss vinyl; labels nearly flawless; may have a small, super light scuff or a few light sleeve or surface marks that do not affect play. What many refer to as "excellent"; close to NM. Full or nearly-full gloss with a few minor surface or sleeve marks; possibly one or a few small, light scuffs or scratches. Expect minimal surface noise, or very slight surface noise in spots. Labels may have very slight wear, possibly one or a couple very minor flaws (noted in description, as applicable). Nearly full-gloss vinyl with some minor surface or sleeve marks; OR slight graying/loss of luster with a few minor marks. Possibly a few small, light scuffs or feelable scratches. Expect only slight surface noise in spots, possibly a few soft clicks. Labels have slight wear, possibly one or a couple minor flaws small tear or writing, etc. Noted in description, as applicable. Vinyl highly glossy with many light surface or sleeve marks and hairline scratches, OR some graying/groovewear and fewer marks and hairlines. Possibly a few or some small light feelable scratches, or a couple longer or deeper ones that do not significantly affect play. Expect slight surface noise (especially on softer passages), possibly with a few or some soft clicks. Vinyl generally has noticeable graying/groovewear, with many light scuffs, sleeve/surface marks and hairline scratches, plus some light feelable scratches; possibly one or a few deeper scratches that do not significantly affect play. OR may be glossy with lots of superficial marks or rubs (possibly covering most or all of the disc when viewed under strong light) which do not significantly affect play. Expect some surface noise, possibly with a few or some soft clicks that are noticeable but NOT overwhelming. Vinyl has lost much or most of its original gloss and generally has obvious or significant graying/groovewear; has many scuffs, surface marks, sleeve marks and light scratches; possibly a few or some deeper scratches that do not significantly affect play. Expect some surface noise throughout that's noticeable but NOT overwhelming - NO skips, sticks, heavy scuffs, excessive noise, or loud "pops" or "clicks" (unless noted in description). OR MORE DISCS - ALL INTERNATIONAL DESTINATIONS. Costs vary by weight and destination. Approximately 10 singles weigh 1 pound. Offered for multiple items - THE MORE YOU WIN, THE MORE YOU SAVE! 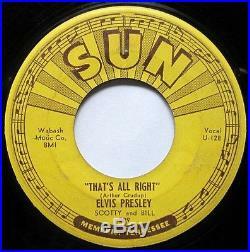 The item "ELVIS PRESLEY ORIG'54 SUN 209 That's All Right 4 PUSH MARKS PLAYS NICELY" is in sale since Thursday, January 12, 2017. This item is in the category "Music\Records". The seller is "newjazz" and is located in Cypress, Texas.